For a long time I've been intending to research perfumes and fragrances. I used to love wearing a little perfume, until I heard that they can be very bad for you and contain neurotxins. I stopped wearing it but always meant to look into it further. 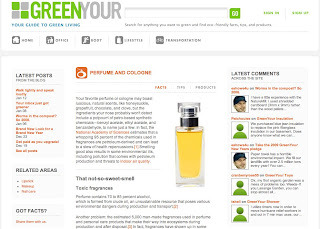 Can you imagine my delight when the little sidebar of my very own blog had "Green Your Fragrance" posted one day? Thanks, Green Your...! Their post is great. It gives the scoop on why synthetic fragrances are bad, plus they list some good, safe choices (just click on the navigation at the top of the article, "facts, tips, products.") I can't wait to locate the scents on the list and take a whiff. And yes, I know the Green Your sidebar is looking a little screwy on my blog. I'll try to fix that next.